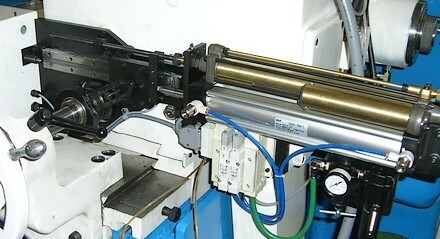 Pneumatic Infeed Centerless Attachment - RSS Grinders & Automation Inc.
RSS Grinders & Automation Inc. This pneumatic infeed attachment is the perfect low-cost way to automate your centerless grinder and reduce your cycle times.It can be integrated with an auto-ejector to simplify life for the operator. Run in single cycle mode when the operator hand-feeds the parts or continuous cycle mode when integrated with an automatic loading system. Your maintenance people will also love this attachment. Hardened rails and a ball slide combine to assure a long and accurate life. Plus, it is virtually maintenance free and most replacement parts are commercially available "off-the-shelf" and readily available from industrial parts suppliers. Rigid construction of 1/2" mounting plate secured to the upper slide by 4 screws and 2 dowels. Quick and smooth operation through hardened rail with ball slide. Power Feed Cylinder with slave cylinder for controlled feed of infeed slides. Micro adjustment for size control through front handwheel. Single cycle or continuous cycle for continuous work with automatic loader. Infinitely variable independent spark-out timer and load timer for dwell between cycle for automatic loader. Air regulator, filter, and lubricator provided for clean air supply. Virtually maintenance free - most maintenance parts are commercial with easy availability. Can be supplied with automatic ejector. Grinder can still be used for Thrufeed work by keeping the attachment in set-up mode. Copyright 2010, RSS Grinders & Automation Inc. All rights reserved.